which begins at 6 pm following the Artist Talk. 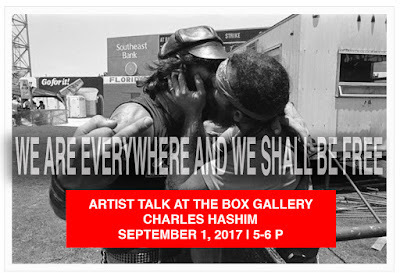 Charles Hashim will be at The Box Gallery to share about his images from his book "We are everywhere and we shall be free" The images and the book are part of the "Kitsch and Kulture" Exhibition which opened on July 15, 2017 and continues through September 2, 2017. All are encouraged to purchase or bring your copies and get them signed by the artist. Copies of the book and select images will available at The Box Gallery day of the talk or, online at Book and Prints Online. Kitsch and Kulture at The Box Gallery, located at 811 Belvedere Road, West Palm Beach, Florida, explores three decades of work by four exceptional artists that have left an indelible visual account of South Florida’s Kitsch Kulture of the 60-90’s era . The exhibition, co-curated by Rolando Chang Barrero and Sandra Schulman, opens with a reception on Saturday, July 15, 2017 at 7 PM and has been extended through September 2, 2017.